The Chinese successfully launched the Yaogan Weixing-25 mission – consisting of three satellites – from the Jiuquan Satellite Launch Center on Wednesday. The launch took place from the 603 launch pad of the LC43 launch complex utilizing a Long March-4C (Chang Zheng-4C) launch vehicle. The designation of the Yaogan Weixing series is used to hide the true military nature of the satellites. In particular this mission is similar to the Yaogan-9, Yaogan-16, Yaogan-17 and Yaogan-20, with three satellites flying in formation like a type of NOSS system, considered as the Jianbing-8 military series. Designed for locating and tracking foreign warships the satellites will collect the optical and radio electronic signatures of the maritime vessels that will be used in conjunction with other information valuable for the Chinese maritime forces. Yaogan-9 was launched on March 5, 2010, while Yaogan-16 was launched on November 25, 2012; Yaogan-17 was launched on September 1st, 2013, and Yaogan-20 launched on August 9, 2014. This launch was the 202nd Chinese orbital launch and the 201st launch of the Long March launch vehicle family. It was also the 71st successful orbital launch from the Jiuquan Satellite launch Center, the 8th launch from Jiuquan this year and the 14th launch in 2014. The site includes a Technical Centre, two Launch Complexes, Mission Command and Control Centre, Launch Control Centre, propellant fuelling systems, tracking and communication systems, gas supply systems, weather forecast systems, and logistic support systems. 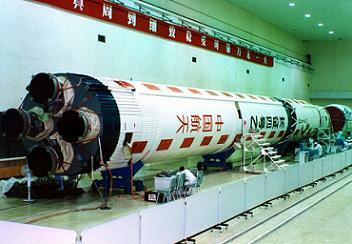 Jiuquan was originally used to launch scientific and recoverable satellites into medium or low earth orbits at high inclinations. It is also the place from where all the Chinese manned missions are launched. Presently, only the LC-43 launch complex, also known by South Launch Site (SLS) is in use. This launch complex is equipped with two launch pads: 921 and 603. Launch pad 921 is used for the manned program for the launch of the Chang Zheng-2F launch vehicle (Shenzhou and Tiangong). The 603 launch pad is used for unmanned orbital launches by the Chang Zheng-2C, Chang Zheng-2D and Chang Zheng-4C launch vehicles.